Following these guidelines is a requirement for posting in this forum and it will also help you to have your post read by the most people. The Wanted & For Sale forum is for poultry advertisements only. Please do not post auction/sale announcements or business advertisements in Wanted & Sales. Duplicate posts are not permitted but pointer posts are allowed in certain circumstances. Advertise them in a topic in Poultry Gatherings. If there isn't a topic about that auction yet, you may start one. You may post a link post in Wanted & For Sale to direct readers to your advertisement for the birds. A moderator will lock this link post. I would like to tell people about some birds I am taking to sell at a market. I do not have a poultry business. Post about it in Wanted & For Sale OR in the appropriate market topic in Poultry Gatherings. Do not post in both. If there is a topic about that market in Poultry Gatherings that you would like to post in, then you may place a pointer post in Wanted & For Sale to direct readers to your advertisement. This pointer will be locked by a moderator. I would like to advertise birds for sale at markets. I DO have a poultry business. Post about it in Poultry-related business advertisements and discussion. You may post a pointer link post in Wanted & For Sales. A moderator will lock this link post but it will be there to direct interested readers to your advertisement. Where can I advertise birds other than poultry? Can I post the same post in two areas? No, duplicate posts are not permitted. What will happen if I post in the wrong place? A moderator will move your post to the correct area. What is a pointer post? It is a post that contains a short description of an advertisement in a different area and a link. Pointer posts made by members will be locked by a moderator. How many posts can I make in Wanted & For Sale? You may have three posts visible on the first page of Wanted & For Sale at any time. * If you are listing Fertile Eggs for sale please include the type of eggs, your location and whether you are willing to post eggs in the subject line. * If you are requesting fertile eggs please also list in the subject line your location and whether you are willing to have them posted to you. When making a post, you will need to choose a topic icon. It is a simple click at the top of the posting screen. Choose the most appropriate icon for your post. * There is a Fertile Egg Exchange Program here. * There is information about poultry transport here. * BYP also provides a Notice Board where people can list their birds for sale. * Feel free to check the Breeders Directory before posting Wanted threads. * It is also worth checking to see if there are any auctions coming up in your area in our Poultry Gatherings forum. 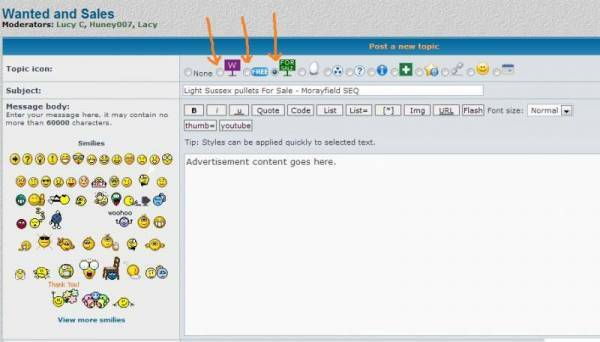 * The edit button is on the bottom right hand side of your post and allows you to edit the subject and body of your post. * Titles can only be changed by editing the opening post. * Please keep unrelated discussions to Other Poultry Talk. Comments by other members on the quality or standard of birds advertised will also be removed without notice. * It is not appropriate to list other peoples telephone numbers without their permission. * Please do not post in upper case. This is considered like SHOUTING and will be edited. * Please don't post any more than 3 threads on the first page at a time. * Members who consistently post incorrectly or ignore requests to edit posts may find their threads removed by moderators. Please read and adhere to these guidelines. In particular, please note that no more than three separate threads by the one member should appear on page one.